Hempstead Supervisor Santino Offers To Work with LI-DOG For More Dog-Friendly Town Parks! 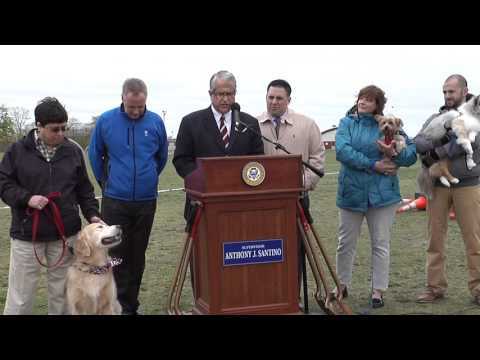 Hempstead Town Supervisor Anthony Santino made a commitment to LI-DOG to work toward making the Town of Hempstead dog friendly by providing access to town parkland. As a result, on September 21, 2016, town residents and their dogs welcomed a beautiful 14,025 sq. foot dog park located in the Newbridge Road Park in Bellmore. This park is only the beginning! After reaching out to Supervisor Santino to express words of thanks for his efforts and the resulting park (Read Hempstead Opens Dog Park at Newbridge Road Park! ), the Supervisor responded with a positive letter informing LI-DOG of his continued commitment to their “dog park initiative.” In his letter to LI-DOG, Supervisor Santino explains how providing canine access to Town of Hempstead parks is a “top priority” and that “protecting animals has been a cornerstone of my administration since taking office.” He closes the letter by saying that he is willing to work with LI-DOG and other community advocates to “determine where additional dog-friendly areas could be made throughout our parks, beaches, and areas of open space”. Read Supervisor Santino’s complete letter. Resident dogs and their families have welcomed this park and have expressed their hope that this be the first of many dog-friendly areas in other town parks. Having support from town officials is a giant step in the direction toward the elimination of the numerous “No Dogs Allowed” signs and restrictions that were enacted in all Town of Hempstead parks. Supervisor Santino’s continued support for the health and socialization of our canine companions is the first step to bringing the Town of Hempstead into a new era. Writing letters, sending emails, and making phone calls to show support for the new TOH dog park and the Supervisor’s dog-friendly initiative will greatly help the campaign for a similar park or on-leash access for additional Town of Hempstead parks and beaches. To let Supervisor Santino know how much you appreciate his new dog-friendly parks initiative, call 516-489-6000, email asantino@tohmail.org, or write Office of the Supervisor, Town of Hempstead, One Washington St., Hempstead, NY 11550-4923.